With that being said, the right approach to treat acne is to control the excess oil production. This can be achieved by either commercial or natural treatments. But if your choice is to go with safe and natural remedies for acne then honey, lemon, apple cider vinegar and aloe vera are some good choices. In this article, let’s discuss on honey for acne in detail. Quick Note: Do you know honey is one of the ingredients of many anti-acne products because of its acne benefiting properties? Still not convinced? Read on to know the amazing benefits of honey for curing acne with scientific proofs. Is Honey Really Effective in Treating Acne? Honey contains antibacterial properties. As per a study, honey manipulates the follicular microenvironment to control the P.acne bacteria. (3) Propionibacterium is responsible for the bacterial action in the clogged pores leading to inflammation. Honey locks moisture in skin cells leaving them hydrated and supple. Dehydrated skin is one of the main reasons for excess sebum production. Use raw honey. You should never use processed honey, as they can irritate your skin more. You should be able to find raw honey at your local food store. Wash your face first, but don’t use a towel or scrub as they can cause irritation. Some treatments should be applied to damp skin. Quick Tip: Cleansing the affected area before applying honey mask improves the effectiveness of treatment by opening the pores and removing impurities accumulated on the skin. Make sure to use a face wash which contains acne fighting ingredients for added advantage. Honey can be either topically applied or internally consumed for treating acne. However, we recommend trying the both as topical application helps to treat external factors and internal consumption helps to treat the root cause. Use a cotton ball to apply a small amount of raw honey to the affected area. Leave it on for 30 minutes and rinse with warm water followed by cold water. Repeat the process regularly for best results. Alternative: Apply honey on acne lesions and cover it with a bandage. Leave the honey application overnight and rinse off in the morning. Repeat the process daily before going to bed. Add 1 tablespoon of honey and 2 teaspoons of lemon juice into a glass of warm water. Stir well and drink it. This mixture also helps to detoxify the body and boost your metabolism. Mix equal quantities of honey and powdered nutmeg. Apply the mixture to pimples. Leave it on for 1 hour and rinse with water. Note: This process may not suit for sensitive people so it is better patch test before applying it on the affected area. Strawberry contains natural salicylic acid which is very effective in treating acne. (8) The acidic nature of strawberries remove the excess oil from the skin. Cleanse your face and pat dry with a towel. Combine 3 mashed strawberries and 2 teaspoons of honey. Leave it on for 20 – 25 minutes and rinse with warm water. Apply any oil-free and non-comedogenic moisturizer. Repeat twice weekly for a month or more until you notice the results. Mix 2 tablespoons of honey and a teaspoon of cinnamon powder. Apply the paste to the pimples. Rinse with warm water and apply toner of your choice. Repeat the process regularly for the best results. The gritty nature of sugar exfoliates the excess oil, dead skin cells and other impurities from the skin pores. Sugar is less harsh than other exfoliating ingredients as it quickly melts so you can over scrub with it. Combine 1 tablespoon honey and 1 teaspoon brown sugar. Apply the scrub to the affected area and gently massage for 3 – 4 minutes. Rinse with water thoroughly and pat dry. Repeat the process regularly until you achieve the results. Blend ½ cup of oatmeal, ¼ cup of warm water, and 2 teaspoons of honey. Apply the paste to the affected area and gently massage for 3 – 4 minutes. Leave it on for 10 – 15 minutes and rinse with warm water. Combine 1 tablespoon of honey and 1/8 teaspoon of turmeric powder. Follow the process regularly without fail. Crush 3 – 5 uncoated aspirin pills and mix it with a teaspoon each of water and honey. Leave it on for 10 – 15 minutes and rinse with water. Repeat the process regularly to achieve the desired results. Note: If you can handle, leave the application overnight and rinse off in the morning. Combine 2 teaspoon of hot water and 1 teaspoon each of honey and sea salt. Leave the application for 10 minutes. Note: This process may leave the skin very dry. A super dry skin can encourage excess oil production. So, apply moisturizer which doesn’t clog the pores after the following the process. Combine 1 teaspoon each of honey and coconut oil. Let it sit for 15 minutes and rinse with warm water. Add 1 – 3 drops of tea tree oil into a tablespoon of honey. Spread a thin layer of the mixture on the affected areas. Let it rest for 12 minutes. Rinse with warm water after 10 – 12 minutes. Note: Avoid following this process, if you are allergic to tea tree oil. Crush 3 garlic cloves into paste. Combine garlic paste, 1 ½ teaspoons of honey and a pinch of turmeric. Follow the process regularly till you get rid of acne. Add 1 green tea bag into a cup of water and let it steep for few minutes. Take out the green tea bag and remove the content from it. Combine green tea leaves and 1 teaspoon of honey. Leave it on for 15 – 20 minutes. Meanwhile you can drink the prepared green tea and relax. Rinse off the application with warm water and pat dry. Grate the skin of the lemon to get lemon zest. Combine 1/8th teaspoon lemon zest, 1 tablespoon of honey, 1/2 teaspoon of lime juice and 1 teaspoon of sugar. Apply the mixture on the affected areas and gently massage in circular motions. Leave the application for 15 minutes. Note: You can use lime instead of lemon. Combine equal amounts of apple cider vinegar and water. Soak a cotton ball in this mixture. Wet your face and affected areas. Gently massage the honey for 5 minutes. Leave the application for 30 – 40 minutes. Rinse off the application with water and pat dry. Take out the soaked cotton ball from the acv – water mixture. Wring out the excess and gently swipe the cotton ball on the affected areas in upward direction. Let it dry completely and apply moisturizer meant for acne prone skin. The antibacterial properties of tomato kill the bacteria causing acne. (20) It also contains antioxidants which heal the skin damage. Combine 1 tablespoon tomato juice and 2 tablespoons of honey. Apply the mixture on the affected areas and massage for few minutes. Leave the application for 10 minutes and rinse off with water. The anti-inflammatory and antibacterial properties of neem help to treat acne effectively. (21) Being a natural astringent, it helps to fade the acne scars and keep the skin smooth. Dry handful of neem leaves under the sun. Crush them into a fine powder. Combine enough amounts of neem powder and 1 – 2 tablespoons of honey. Apply the paste on the affected areas. Leave it on for 20 minutes and rinse with warm water. The anti-inflammatory and antioxidant properties of red sandalwood powder reduces the inflammation and redness. (22) This combination is effective in treating mild – moderate acne. Combine 2 teaspoons each of red sandalwood powder and honey. Add 1 teaspoon of water and mix well. The lactic acid present in milk helps to exfoliate the dead skin cells and other impurities from the skin pores. This combination work well for treating mild acne. Combine 1 tablespoon of honey and 1/2 tablespoon of milk. Gently massage in circular motions for few minutes. Let it rest for another 20 – 30 minutes. Mix 1 tablespoon each of aloe vera pulp and honey. Leave it on for 10 minutes and rinse it off with lukewarm water. Repeat the process 2 – 3 times in a week. Apple contains acidic content which helps to balance the pH levels of the skin. This helps to restrict the excess oil secretion. Apart from that it also provides nutrients to the skin. Blend half an apple (without seeds) into a paste. Add 2 tablespoons of honey into the apple paste and mix well. Leave it on for 15 – 20 minutes and rinse with water. Into a blender, add 1 cup of fresh parsley leaves (remove the stems), lemon juice and manuka honey. Blend the ingredients to get a thick paste. Leave it on for 20 minutes and rinse it off with water. If you are allergic to pollen grains then it is better to avoid it. As it may cause rashes, redness and irritation. If consumed, then it can cause swelling, asthma, coughing, wheezing, breathing troubles, difficulty in swallowing, and so on. Eating raw honey in large amounts can lead to abdominal discomfort and anaphylactic shock. People with diabetes should avoid its consumption as it can increase blood sugar levels. People having blood disorders or who take medications for it should avoid it as it can increase the internal bleeding. Honey should be taken with caution when taking other antibiotics like aspirin, ibuprofen, heart medications, weight loss supplementation and warfarin. Honey produced from Rhododendrons is known to contain some toxins that can lead to adverse reactions. If you have a weak system then it is better to avoid honey consumption as it can increase the risk of bacterial and fungal infections in the body. If the application of honey is causing breakouts then stop using it and try a different remedy. Make sure to patch test any application before trying out the process. If you observe any negative reactions, then avoid using it. Avoid squeezing, scratching, pricking or rubbing pimples as it can worsen and leave a scar behind. Avoid using greasy cosmetics or creams as they may clog the pores. Reduce the amount of exposure to the sunlight as it can worsen the acne. Always use a mild soap and warm water to wash your face. Avoid using soaps that contain harmful chemicals like paraben and laureth sulphate. Scrubbing harshly can damage your skin. So make sure to do it as gentle as you can. Take a shower as soon as you can after a workout. Make sure to remove the makeup before going to the bed. Consume nutritional food to strengthen your immune system. Do yoga or meditation to reduce the stress levels. How long does It Take for Honey to Cure Yeast Infection? Well, this is a quite difficult question to answer as the results vary from person to person depending on skin texture, healing capability, severity of acne and other factors. So, we recommend our readers to try any method for at least few weeks to judge whether the ingredient is helpful or not. If it is not showing even a slightest improvement then you can shift to another effective ingredient. Can We Leave Honey Overnight on Skin? Yes, you can safely leave it on the skin overnight. However, make sure to put on some old clothes and bedsheets to avoid stains. What Kind of Honey is good for Treating Acne? Do you know that there are almost 300 types of honey available in the market? Surprising isn’t it! Some of the popular one are buckwheat, Manuka, neem and Acacia. The composition of honey depends on the environmental condition in which they harvest. Be it either for topical application or internal consumption, we recommend to try the darker varieties. The darker and denser versions of honey contains more amount of nutrients and enzymes than the lighter and processed ones. Processing strips off the essential nutrients and beneficial properties of honey. Was this article helpful for you? Do you have any other remedy that works better than the above mentioned? Share your suggestions, comments and experiences in the comments section below. 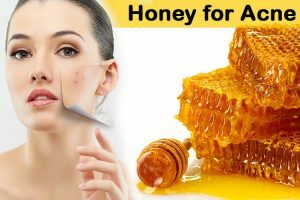 How to use honey in day to for pimples n scars? Apply some honey on pimples and scars and leave it for 15 minutes. Rinse it off with water. Repeat the application daily. Good luck and share your experience with us. I do not know how exactly they are called, but I had – still have white heads (not the ones that pop easily) all over my lower part of my cheeks, And I have been having honey masks every day for over a month now and the results are very pleasing! Also I do have to mention, I use natural mineral powder every day – to even out my skin tone, but in the evening I rinse it of with washing foam (instead of cotton and makeup remover) and when I changed my face cleaning routine i started seeing results, only very recently in comparison did i start honey masks. Does d honey sugar scrub have side effects, for hau long are u supposed to use it to get best results? If you are allergic to pollen then honey may cause side effects. Don’t use the scrub on cuts, wounds, blisters and rashes. It is very difficult to tell the exact time, as everyone has different skin tone and healing capacity. So be patient until you achieve the results. Can i use 100#pure honey instead of raw honey? I like your article. But I think this is very common now. Almost every skincare problem have a home remedy. .Honey reduces pimples especially the red ones due to its anti-bacterial properties. But can i use honey for anti-wrinkle treatment. Does generic Kroger “100% pure” honey work for this? I’m super nervous, I don’t want to make my acne worse! If it is organic and pure then it will work. Hi I have a simply balanced raw wildflower honey will this work on my face? I really really don’t want my face to breakout I will be so sad. Let me know if this type works or not? I got a question, welll i have a dried pimple with puss in it, and idk if honey could help it pop less than a day….? Idk wht i should do. I dont wanna go to school w a big pimple in the middle of my forehead! Help!? Try any of the honey methods mentioned in the article. It is difficult to tell the exact time of healing the pimple as everyone’s skin and healing capacity is different. So try the method with some patience. It depends on the person’s skin texture and other factors so it is difficult to tell the exact time. So try the methods regularly with some patience until you achieve the results. Apart from that you have to exfoliate and moisturize regularly. Can I use raw honey instead of d natural one since it’s not easy getting d natural honey. I was wondering what kind of honey would be best for me? I have dry, acne prone-ish (some would say I don’t have pimples, but I do. They get easily inflamed and flaky) skin and nothing seems to work. As I live in Denmark most of the honey I have seen here is organic blossom honey – would it work?. Is there anything specific I should be looking for in a honey? You can use the organic blossom honey if it is pure and raw. i want my acne to be healed fast.can i use pure honey every day??? Would applying lemon and honey and leaving it overnight help the acne and scars? Yes, it helps. Honey contains antibacterial properties which deal with the bacteria causing acne. Lemon contains citric acid which removes the accumulated dead skin cells and impurities from the skin pores. Should i wash the face before applying honey over it?? Yes, washing your face with warm water helps to open up the pores and remove any impurities on the skin. I have dermatomyositis and causes a skin rash ,like pimples and red will the honey help this? How would I mix this? Can I use fake honey like the ones u get in stores? No, you have to use raw, pure and organic honey. Is it ok if I just leave the honey all night in my face… or do I have to take it off? It is safe to leave the honey application overnight. Great article! Should I use a facewash when removing the honey application or will warm water be more effective? I have pretty sensitive, oily, and sometimes dry skin. What moisturizers would you recommend that won’t clog my pores? How can I know that honey suits my skin or not?? By doing a simple patch test you can find out whether honey is suitable for your skin or not. Just apply some honey on your arm and leave it on for 1 hour. If you are experiencing any negative effects like irritation or burning sensation then avoid using it further. If not, then you are free to use it daily. Is it possible to remove my nose bumps using honey? Yes, you can. Choose any one among the above and try it regularly to reduce the nose bumps. Does honey with just a little lime work to remove pimples? Yes, the combination of honey and a little lemon also helps to treat acne. Try it regularly and share your experience. I really don’t knw what to do, I hv tried a lot of tubes creams for ache but all my effort is not giving a positive results at all…I just hope this one works for me, I will be in cloud 9 if it works…I am tired of seeing ache and dark spot in my face….plz some should recommend a good tube cream 4 me…. Can I use the green honey? Is it ok if I use green honey? Is the honey turmeric mixture, honey sugar mixture, and honey strawberry paste harmful if applied at night before sleep?